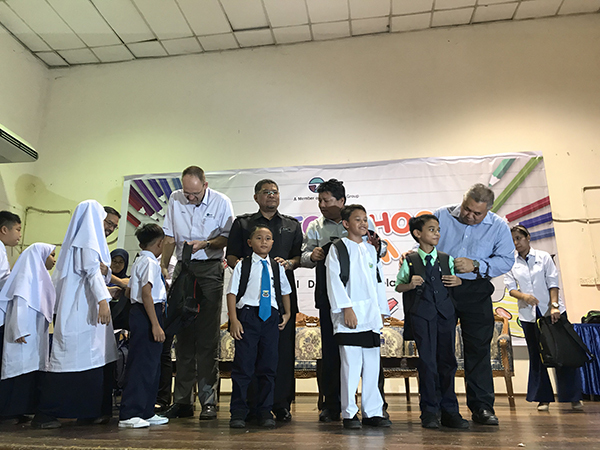 Port of Tanjung Pelepas (PTP) chose a total of 270 underprivileged primary and secondary students from schools within the Iskandar Puteri area as part of its Corporate Social Responsibility (CSR) education initiative, Back to School Programme 2019. The programme was held at the Gelang Patah Community Hall. Also present were Sr. Dzulkefly Ahmad, Johor State EXCO of Housing and Rural Development and Iskandar Puteri Assemblyman, Mazlan Bujang, Johor State EXCO in Public Works, Infrastructure and Transportation and Puteri Wangsa Assemblyman, Senator Ir Md Nasir Hashim, Senate Parliamentary Member, representative from Johor Bahru District Education Office, PTP Senior Management Team, school principals, teachers and parents of students involved in the programme. 2019 marks the 12th year anniversary since PTP first organised the Back to School Programme. Apart from that, PTP also actively organises other CSR programmes such as English Tuition, English Boot Camp, English Communication Workshop and Motivational Talks for UPSR & SPM students as well as Career Insight Programme, involving selected local university students from various maritime studies such as the Maritime Management Studies, Nautical Science and Maritime Technology Applied Science.